Who is Jenna Fox? Seventeen-year-old Jenna has been told that is her name. She has just awoken from a coma, they tell her, and she is still recovering from a terrible accident in which she was involved a year ago. But what happened before that? Jenna doesn’t remember her life. Or does she? And are the memories really hers? This fascinating novel represents a stunning new direction for acclaimed author Mary Pearson. Set in a near future America, it takes readers on an unforgettable journey through questions of bio-medical ethics and the nature of humanity. Mary Pearson’s vividly drawn characters and masterful writing soar to a new level of sophistication. What would you do to save a human life? And, better yet—and perhaps more importantly—what defines a human life? 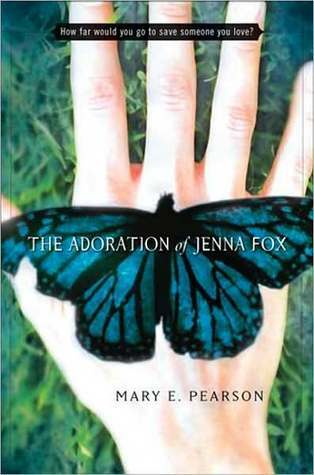 In Mary E. Pearson’s The Adoration of Jenna Fox, these are the two underlying issues of the book. On top of that, though, is the dilemma every teen faces: Jenna is trying to figure out who she is. It’s hard to rave about this book without giving too much away. Even with what I’ve said already, I’m scared that I’ll have ruined the book for someone. The Adoration of Jenna Fox is a beautiful mystery. Pearson has crafted it very well. I “read” the book in audio format, usually listening to it when I walked home from work. Instead of pausing it and finishing it the next day, I went and sat on my bed for the last few hours of the novel; the mystery was just that engaging! The narration of the book is very lyrical. In fact, had I not bought a hardcover of the book—yes! that’s right, after having the book in audio I went out and bought a hard copy just so I could have it on my shelves—I never would have known that some of the book is actually written in verse. I think the flow of the narration is done very well, and really keeps the reader engaged throughout Jenna’s self-discovery. Jenna’s character is very enduring because she faces many of the same problems that teens do. A main point in the book is her desire for freedom. Even teens not in Jenna’s unique circumstances deal with this. All the characters are very real; they could easily jump off the page. I felt that Jenna’s family and their different reactions to Jenna’s situation were all well done. I liked that it wasn’t perfect. Lily, Jenna’s grandmother, dislikes Jenna, and this was completely believable. Alyss, Jenna’s friend, was also well written, and I enjoyed how well her passion for the environment and medical science played in so well to the main story and to her story. I thought that the relationship between Ethan, the love interest, and Jenna could have been played out more. I didn’t find it as believable, but the last thing that Adoration is is a love story, so I could push that aside. This book has been optioned for a movie, and I really hope that it doesn’t fall apart, because it could be something very beautiful. Aside from the fact that this is one of the very few novels that really kept me on my toes and constantly guessing and re-guessing what was going on, I really liked how the mystery and science of the novel was still based on real-life issues. Just like other teens, Jenna wants to know who she really is, and it’s because of this that the book resonates so well. I know this review doesn’t say much about the plot. It’s because the book is so chock full of mystery and suspense that there is very little I can really say about the book without ruining it for you. Since the mystery makes the book, I simply can’t let that happen. I believe this book has a lot of dystopian elements, even though it’s not exactly The Hunger Games or Divergent, because it is set in the future where vast medical advances have been made. Genetic engineering and its effect on the environment are discussed in the book and play very well into the plot. The book deals with whether we as humans have the right to play God. The world, in this book, also deals with environmental changes. These changes are talked about but they don’t affect the plot of the story. There is, of course, a sequel coming out in August called The Fox Inheritance. I can’t say anything about it because it would spoil the book but I am looking forward to it!